Fake out your guests at your Summer BBQ with these hamburger cookies! 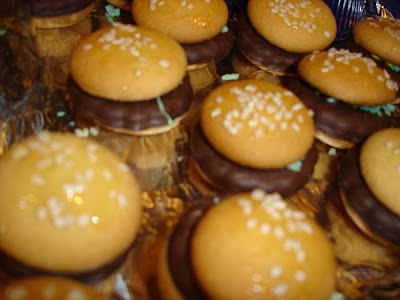 These are much easier to make than some other fake out hamburger cookie recipes....easy enough for the kids to do! To create your cookies begin by placing 1/4 cup frosting in 2 small bowls. Tint one red and the other yellow. Frost the bottom of 20 vanilla wafers yellow; top with a peppermint patty. Spread the peppermint patty with red frosting. Brush the tops of the remaining wafers with simple syrup and sprinkle with sesame seeds. Place over the red frosted peppermint patty.